(CNN) -- Eight years after Florida's hanging chads exasperated voters and helped usher in sweeping changes in voting technology, many election observers remain concerned about the accuracy of the electronic voting systems most Americans will use November 4. Early voters cast ballots on touch-screen machines Wednesday in Las Vegas, Nevada. Touch-screen machines can occasionally fail or register votes for unintended candidates. Optical-scan systems can have trouble reading paper ballots that are too long or marked with the wrong ink. At least one study suggests that electronic voting machines can be easily hacked. 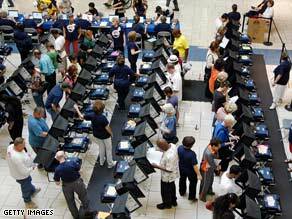 And some 9 million voters, including many in the battleground states of Ohio and Florida, will use equipment that has changed since March, increasing concerns about errors next Tuesday. "You can be almost certain that there will be irregularities in some places around the country," said Rep. Rush Holt, D-New Jersey. "The problem now is that roughly a third of voters nationwide will use unverifiable electronic machines. So if there are uncertainties, there will be no way to resolve them." If you have a problem voting or see a problem, call the CNN Voter Hotline at 1-877-GOCNN08 (1-877-462-6608); CNN will report on some of your calls and our partner, InfoVoter Technologies, can help get you in touch with your election board or find your voting location. "There are going to be places where voting machines break down. It happens every time there is an election," said Susan Greenhalgh, spokeswoman for Voter Action, a nonpartisan organization dedicated to integrity in elections. "We have to hope that there aren't problems with the accuracy." And those infamous punch-card systems? They're still used in a handful of counties in Idaho, the last state in the nation to do so. Some observers believe this patchwork quilt of electronic, mechanical and paper balloting from state to state -- even county to county -- makes it more difficult to regulate voting systems. According to a joint report released this month by three nonprofit democracy groups, including Common Cause, 22 states use electronic voting machines that produce no voter-verifiable paper record. "It's a huge mess," Greenhalgh told CNN. "This is the most important fundamental characteristic of our country. It is our democracy ... and our votes need to be recorded and counted in a way we can trust." Election officials nationwide rushed to embrace new voting technology after the disputed 2000 presidential election, in which Florida's punch-card balloting system was blamed for thousands of miscast votes. Congress in 2002 passed the Help America Vote Act (HAVA) to replace punch-card systems with newer, upgraded equipment. The act also created a bipartisan agency, the Election Assistance Commission, to oversee and certify voting systems. Flush with federal money, many states and counties purchased shiny touch-screen, or direct-recording electronic (DRE) machines. Their simple interface, similar to an ATM's, allow voters to cast votes by pressing a colored area on a display screen. A University of Missouri study of 2004 voting results found that newer touch-screen machines had an error rate of 1 percent, compared with 1.7 percent for punch-card ballots. But the Election Assistance Commission has yet to certify any of these machines. And election watchdog groups complain many of the machines do not produce a paper record of votes cast, making it difficult to verify disputed results. "The lessons that some people took away from Florida in 2000 weren't necessarily the right lessons," said Pamela Smith, president of the Verified Voting Foundation, a nonprofit group that advocates for reliable elections. "There was this sense that paper must be bad because of the problems people had with the hanging chads. "But you need a hard copy record so you can go back and confirm the results," Smith added. "The issue really is about the public having justifiable confidence in the outcome." Most concerns about electronic voting have focused on touch-screen machines. Ohio Secretary of State Jennifer Brunner sued the maker of the touch-screen equipment used in half of Ohio's 88 counties in August after an investigation showed the machines "dropped" votes in recent elections when memory cards were uploaded to computer servers. Critics also say the machines can be easily manipulated. Andrew Appel, a professor at Princeton University's Center for Information Technology, issued a report earlier this month that said the touch-screen machines used in 18 of New Jersey's 21 counties can be hacked into in as little as seven minutes. Appel said that someone could replace a voting machine's memory chip with one containing a fraudulent computer program that tweaks the results. The machines' manufacturer, Sequoia Voting Systems, has disputed Appel's findings. Appel and his team were given the source code to the machines, said New Jersey Secretary of State Nina Mitchell Wells. In a prepared statement, Wells said New Jersey state election officials have "expressed complete confidence in the state's voting process and the security of its voting machines." Ken Fields, spokesman for ES&S Inc., another major provider of electronic voting systems in the United States, insists that his company's touch-screen machines have enough safeguards. ES&S machines operate on a closed computer network and contain three independent memory chips that can be cross-referenced against one another to confirm balloting results, he said. "I assure you the technology is tested rigorously and has to demonstrate that it's precisely accurate and secure," he said. "We can't speak for anybody else. But the experience we have seen is that the equipment works as it's designed, and works well." Most electronic voting machines are equipped to produce paper records if required by an audit, said David Beirne, executive director of the Election Technology Council, a trade association for voting-system vendors. Recent reports of "vote-flipping" on touch-screen machines -- when a vote for one candidate is recorded as a vote for another -- can be explained by voter error or election workers not properly calibrating the machines, Beirne said. By 2006, some jurisdictions around the country were mothballing their DRE equipment in favor of optical-scan machines. Voters use a pen or pencil to mark paper ballots, in the way that students fill standardized tests, which are then fed into scanners that record the results. Many observers believe that optical scanners -- especially ones that count the ballots at the election precinct, not at a central office -- are the most reliable voting method. Those systems' error rate in 2004, according to the University of Missouri study, was 0.7 percent. If a voter has made a mistake filling out his or her ballot, the optical scanner will spit out the ballot and give the voter a chance to correct the error before leaving the polling place, Appel said. "This is not a silver bullet. No technology is perfect," Appel told CNN. "But at least the optical scan ballots have a better resistance to [inaccuracies]." So how can voters on Tuesday be absolutely sure that their ballots are being recorded with 100 percent accuracy? They can't, most election observers say. But election watchdogs and voting-system industry officials agree on one thing: People voting on touch-screen machines should take their time, read the ballot instructions carefully and not be afraid to ask for help. "If the equipment is not participating the way you think it should be, don't hit the 'cast vote' button," said Rosemary Rodriguez, chair of the federal Election Assistance Commission. "Call an election official, a poll worker for help. Get it addressed immediately and on the spot. There is no going back if you hit the 'cast vote' button." CNN correspondent Miles O'Brien and CNN producer Marsha Walton contributed to this report.